Watt is the international unit for power (electric, mechanic and thermal). In other words, Watt is the product of the electric current (Ampere) multiplied with the electromotive force (Volt). To use a mechanical water-analogy, Ampere measures the amount of water (current) flowing through a pipe (conductor) while the Voltage is the water pressure (electromotive force). Both factors determine the power at the end, measured in Watt. Exactly like your garden hose. Watt is the rate at which your electric water kettle consumes energy. The higher the wattage, the shorter the boiling time. Let’s take this further and calculate the time it takes to boil 1-liter water in a kettle with 2000W. Let’s assume the tap water is 7°C so you need to increase the temperature by 93°C to reach the boiling point. We also know the specific heat capacity of water which is 4.186kJ (for more info see here). It means that you need the heating energy of 4186 Joule to increase the temperature of 1-liter water by 1°C. It takes 3.24 minutes to heat 1l of water in a 2000W kettle. In reality, we know that it takes much longer. 1. We assume a perfect energy transfer from the heating element to the water which doesn’t happen in reality. 2. Since the heating element is hidden, it needs to heat the bottom of the kettle as well, not just the water. 3. We have not allowed for loss of energy which always occurs. 4. You might not be able to draw the full power under certain circumstances, for example, living in America. Does water boil slower in America? There are reports of people wondering why their kettles seem to take much longer in the USA, Canada or Costa Rica. What those countries have in common is the voltage of 110/120V. Lower voltage could result in less power consumption. If any of the factors in the equation have a lower value (Ampere or Volt), the product, power (W), will be lower as well. To demonstrate, we assume that your circuit breaker (or fuse) is set to 10A (if more than 10A is drawn your circuit will trip). The maximum power output of your electric circuit is 1100W. What are the consequences for your kettle? 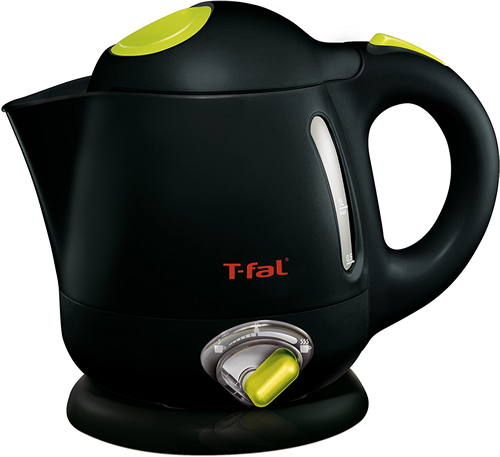 You just bought the T-fal temperature controlled kettle with 1750W. It is cute and advertised to boil a cup of water in 90 seconds but, not in your kitchen. You write an angry e-mail to T-fal, Amazon and the pope (for good measure) to complain about false advertisement and the bad world nowadays in general. Read this blog again, relax and save your energy for more important things in life. Due to the limited availability of Volt (110v instead of 220V in Europe or 230V Australia) and Ampere (10A instead of a 15A breaker/fuse) in your household, your shiny new kettle has only 1100W to heat the water. It’s power capacity, however, is 1750W. What should take 90 seconds with 1750W might now require 120 seconds with 1100W. Therefore a kettle used in America might boil water slower than in countries with higher voltage. 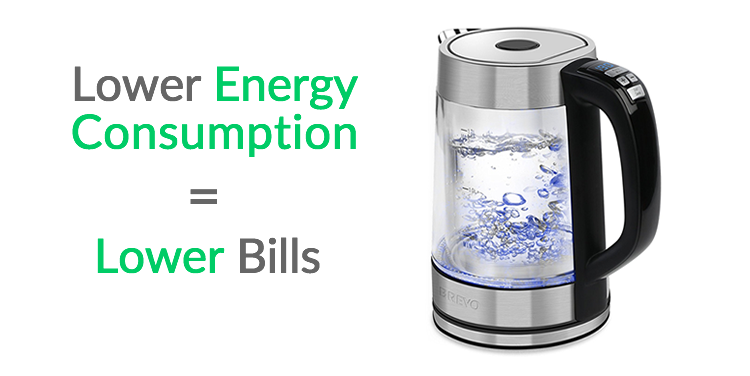 Lower consumption goes in your favor when it comes to your energy bill. The lower the drawn power, the less energy you use, the less you pay. It is a win-win situation for you and the environment. The faster the boiling, the higher the energy consumption (= energy bill). It is advisable to check your circuit settings before you buy a high-powered variable kettle. Use the above equation to calculate the maximum output. Now check the wattage of your favorite kettle with our comparison table on this website. The power consumption of the kettle you are going to buy should roughly match or be lower than the maximum available power at your kitchen circuit. 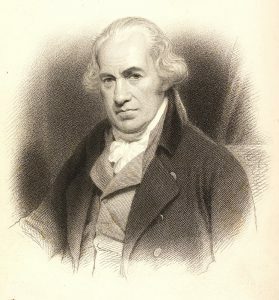 James Watt was a Scottish inventor. He dramatically improved the steam engine which played a crucial part in Britains Industrial Revolution in the 18th century. According to an often-told story, Watt took his idea from a boiling water kettle. The power of the steam lifting the lid inspired him to re-design the steam engine and make it more powerful and efficient. James Watt also came up with the term ‘horsepower.’ There was no other word for it in the 18th century, and the pulling power of horses was a concept everybody understood. Today a metric horsepower equals 735.5W. For most people going on the hunt for a new temperature controlled kettle, the wattage is something they ignore because they don’t know what it means. After reading this blog, I hope you have at least an idea. Buying a kettle with suitable power consumption is sound advice. It makes no sense to pay more for something you cannot use and will increase your energy bill as well. Be smart and love your kettle.